An explosion at a Florida chemical plant over the weekend left at least one person dead, according to local authorities. The Pensacola News Journal reported that the blast occurred around midday Sunday at the Ascend Performance Materials complex in a facility operated by distribution giant Airgas. 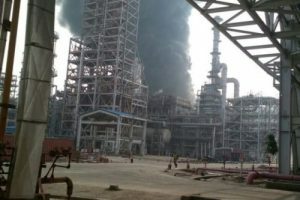 The explosion, whose cause remains under investigation, involved nitrous oxide gas and generated a plume of yellow smoke that rose from the plant. The incident did not pose a threat to the public and no additional injuries were reported. Witnesses told the paper that they felt the explosion more than two miles away. Ascend, which manufactures chemicals, plastics and fibers, indicated that its employees were safe and said it was cooperating with authorities.